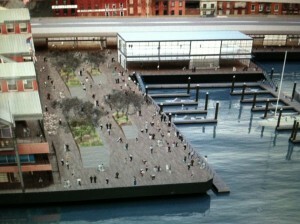 SOUTH STREET SEAPORT – NEW MARKET site: Will public rights be trampled for big-moneyed interests? Out of public view, more than one real estate developer (Howard Hughes Corp. being the latest) has worked in concert with a city agency (the Economic Development Corp.) over the past few years to remove the New Market site – an integral component of the historic old Fulton Fish Market – from the public domain. A battle is now underway pitting public rights over this valuable public area along the waterfront against a private developer’s attempt to gain control over the public space and remove it from the public reach. With evidence of destruction to our surroundings from unchecked development, and growing awareness of our collective responsibility to protect our environment for all of us, federal legislators enacted into law the National Environmental Policy Act of 1970; that same year the Environmental Protection Agency was formed. Along with governmental response, the public itself was taking action to increase awareness of the responsibility we all have – individually and collectively – to protect the surroundings that nourish us. Rachel Carson’s SILENT SPRING 1962, The EARTH DAY movement begun in the Spring of 1970, and other initiatives were bringing awareness to the general public of what was happening to our valuable resources. Recognizing the importance to the public interest of our waterways and the need to safeguard them for the benefit of all, the US Congress passed the Coastal Zone Management Act of 1972 followed by attendant programs to coordinate and implement its goals. State and local legislators in consultation with community groups and other stakeholders used the federal framework to provide more specific guidelines for coastal areas development and waterfront revitalization at the state (1st iteration: NYS Waterfront Revitalization and Coastal Resources Act of 1981) and local levels. NYC’s original Local Waterfront Revitalization Program (LWRP) was implemented in 1982 to further adapt the State’s 1982 Coastal Management Program to the city’s waterfront areas. Revised in 2002, additional revisions were proposed in 2012 to incorporate updated input from the city’s 2011 release of “Vision 2020: the New York Comprehensive Waterfront Plan” (which builds on the original city Comprehensive Waterfront Plan of 1992). In all of the laws and programs put in place, the need to protect and preserve our valuable resources for the benefit of all is a driving force. In recent years, New York City’s elected representatives have worked hard to reclaim Manhattan’s waterfront for everyone to enjoy. NY’s waterfront revitalization studies and programs, using Federal and State guidelines for responsible, appropriate development along the waterfront and over the waterways, continually acknowledge the city’s responsibility to insure the public’s access to its waters. Following on the success of the Hudson River Esplanade project on Manhattan’s west side, city agencies, under the direction of the Mayor, continued with a study to reclaim the waterfront on the east side of Manhattan. This effort – the East River Waterfront Study of 2004 -resulted in the document outlining concepts for “Transforming the East River Waterfront”. 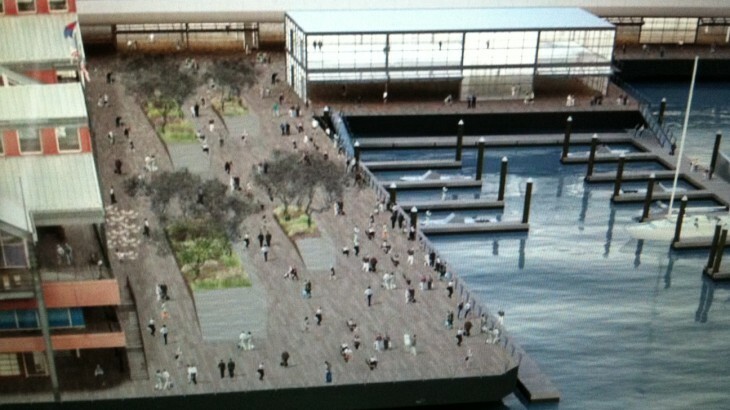 The piers along the East River present a unique opportunity to bring the community out to the water’s edge. The experience of public open space over the water has been extremely successful in other parts of the City. New pier construction presents the opportunity to turn underutilized areas into public space and to provide healthy habitats for local marine life. After 2004, as New York’s waterfront was coming back to life for the public, real estate’s interest in the waterfront ramped up. Nowhere is this more evident than at the South Street Seaport area’s New Market site. To preempt any adverse input from the public, the Economic Development Corp., a city agency, worked behind the scene in an attempt to turn over development rights and control of the public New Market space to the Howard Hughes Corp. This was counter to all waterfronts planning to date as briefly touched on above. It was also counter to the city’s own concept planning for public use of the New Market site, as illustrated by a schematic diagram and a rendering of a proposed reworked New Market building included in the city’s document – “Transforming the East River Waterfront”. The two New Market images are included above, and can be found in the document, Section 5 – Pier Projects, pages 52, 53. The actions of the EDC, the city’s own agency, portend a shift by the city towards giving real estate interests priority over the public’s rights to public places. – And for those closely following South Street Seaport developments, what might appear as a relatively harmless statement added into the Oct 2013 approved revisions to the NYC Waterfront Revitalization Program readily brings to mind a certain proposed 494 foot tower on the New Market site – a coincidence ? The fight to preserve public assets for all is happening all over our city, and playing out now at the historic South Street Seaport.